I am a Classic Movie fan. I drive my family a bit nuts due to our dvr list being full of old movies’ titles. Turner Classic Movies is my favorite channel, and I am often watching one of the movies from that channel and not watching network tv. Our family usually stays home on New Year’s Eve, munching on favorite snacks, and watching movies. With all of this in mind, I thought I’d make some Classic Movie suggestions for New Year’s Eve viewing, movies that I have seen and highly recommend. If you like a good mystery, with a bit of comedy mixed in and espionage, than The Lady Vanishes is for you. It was one of director Alfred Hitchcock’s biggest hits in England, and he made this movie in 1938. The movie stars Margaret Lockwood, Michael Redgrave, Paul Lukas, and Dame May Whitty, as the vanishing lady of the movie’s title. Most of the action takes place aboard a train as a group of British travelers are winding their way across continental Europe in order to get to a port city in France to then take a boat back to England. Margaret Lockwood’s character is a young, rich socialite, who befriends Dame May Whitty’s character. Upon awakening after a nap, Lockwood goes about the train to find Whitty, and she is not there, she has vanished! No one on the train believes her that the elderly lady was on the train. Michael Redgrave, playing a handsome music professor, agrees to help Lockwood search the train to find the missing elderly lady. This movie was one of Hitchcock’s last British movies before he came to America and Hollywood. In fact, this movie did so well at the British box office, that it helped Hitchcock prove to American movie studios that he knew how to make successful movies and he was able to make a nice, profitable deal with MGM, who he made his first American movie with. The plot is very straightforward and pulls no punches. A teen has been on trial for murder. 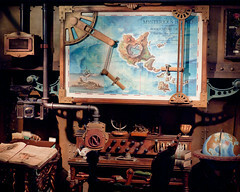 The action of the movie takes place in the jury’s deliberation room. All but one of the jurors thinks the teen committed the murder and it is up to that one juror, Henry Fonda, to carefully relook at all of the evidence with his fellow jurors, and to see if it is possible that the teen is innocent. The movie is riveting, and we also get to know each juror and what makes him tick, why some of the jurors are eager to just get a verdict in and leave so they can get on with their weekend plans. Jurors and their prejudices are also scrutinized by Fonda and one another. The movie is tense, dramatic, well-acted, and makes one look inward; how would we act if we were on a jury, deciding upon a life and death situation? For an exciting family adventure, one cannot go wrong with a Disney movie and one of my favorites is 20,000 Leagues Under the Sea. The famous novel was written by Jules Verne and Walt Disney decided to make a movie based upon this popular book. The movie appeared to American audiences in 1954, and it starred Kirk Douglas(who sings in the movie, and not too badly! ), James Mason, Paul Lukas, and Peter Lorre. and a strange and engimatic Captain Nemo, played by James Mason, are responsible for the sinkings. With Captain Nemo’s dire warnings about the environment, the movie doesn’t seem that dated, and what more can one ask for then an epic submarine vs. giant squid battle! Milly takes on the task of turning these 6 new brothers-in-law into gentlemen. She also impresses on them how to properly court a girl. At a local barn raising, potluck and dance, the 6 brothers set their sights on 6 ladies from the town, who are unfortunately seeing 6 men from the town. Adam, seeing his brothers moping around the cabin as winter sets in, tells them about a story written down by Plutarch, how some Roman Soldiers got wives from the Sabine Women. The brothers take Adam’s advice and hilarity ensues. 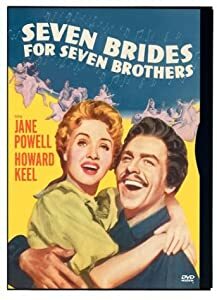 An interesting side note is that at the same time Seven Brides was in production, MGM was pouring more money and time into another musical, Brigadoon. The studio fully expected Brigadoon to be a box office smash and to their surprise, Seven Brides for Seven Brothers was the smash hit, and Brigadoon didn’t fare as well at the box office. The roles of the brides and brothers were mostly filled by dancers, but Julie Newmar-pre Cat Woman days, and Russ Tamblyn-before he played Riff in the movie West Side Story, are a bride and brother you might recognize. For a fun, toe-tapping way to welcome in the New Year, don’t overlook this gem!